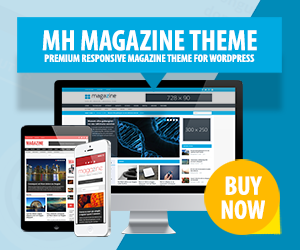 Multi-purpose WordPress themes are useful for many types of websites and purposes, be it for modern online magazines, dynamic news portals, business websites, personal blogs or editorial websites. High-quality multi-purpose WordPress themes are usually highly customizable and flexible as they are able to fit various needs. In terms of design you can find minimalistic multi-purpose themes as well as those packed with complex and rich design features full of animations and effects. When creating WordPress websites there are thousands of different themes for several purposes you could use to present your website content. The advantages of using multi-purpose WordPress themes are thus obvious. You can try different layouts depending on what kind of website you are creating and you can use all sorts of features based on what you want to achieve with your website. As multi-purpose WordPress templates are highly customizable, they will give you a great bunch of opportunities and creative freedom. With multi-purpose WordPress themes you are usually not limited in any way. You can create business websites with a professional touch, nice blogs with any kind of topic or several other types of online presences. If you plan to extend your templates functionality, make sure your multi-purpose WordPress theme is compatible with those extensions and plugins you would like to use later on. Whatever website you are planning to launch, you’re welcome to have a look at our extensive collection of popular multi-purpose WordPress themes.